One thing I like to do when I go to a foreign country is snoop around and test out some snacks that you might not find out at home. Here are a few from my stopover in London. The 99 Flake – a soft ice cream cone with a Cadbury Flake chocolate bar stuck in it. I actually didn’t have any this trip (was too cold at the time), but I still remember the first time I had one. It was while on a day tour of the Scottish Highlands and I spotted a little stand selling them in a little Scottish town we stopped in for a quick potty break. The cold of the ice cream makes the thin layers of the Flake a little brittle, and you can use the Flake to scoop up your quickly melting ice cream. This photo was of a stand that was just outside of Hampton Court Palace. The poor guy inside must have been freezing! I don’t drink a lot of alcohol, but I’ve really become attached to hard ciders. While it’s harder to find a quality cider here are home, over in England they are everywhere. 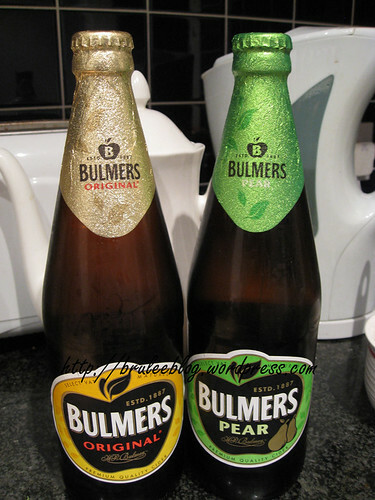 I was told that I should try Bulmers because they were better than Strongbow, so I picked up a bottle of apple cider and another one of pear cider. They were crisp without being overly sweet and I enjoyed them, but I was a little let down by the pear cider because it didn’t taste of pears at all and was almost indistinguishable from the apple cider. When you go to another country, you gotta learn the snack lingo. Over there, chips = French fries and crisps = potato chips. 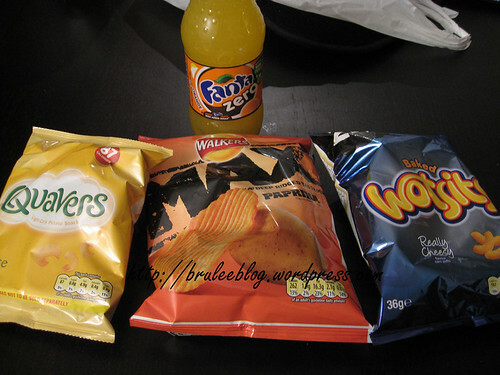 I think my favourite so far is still the Walkers Worcester Sauce crisps, but I tried a few other ones this time. Also in the photo is an orange Fanta. I love drinking Fanta over there because it tastes more like Orangina than orange soda. And I was intrigued by finding a Fanta Zero, so I bought it to see if the flavour changed a lot due to the artificial sweeteners (wasn’t bad but the real thing is still better). The crisps pictured here are Quavers (cheese flavoured potato chips in a corn chip shape), Walkers Max Paprika (ripple chips) and Wotsits (cheese puffs). The Quavers were kind of salty and bland. The Wotsits weren’t as cheesy-tasting as my favourite Hawkin’s Cheezies and they weren’t as crunchy either. The paprika crisps were good and did taste exactly like paprika. As a treat one evening, our hosts made us some apple crumble topped with THE best non-dairy ice cream that I have ever had. 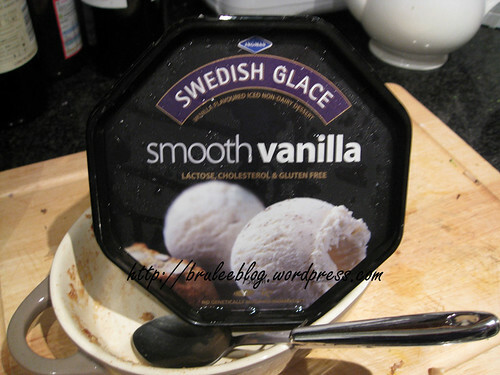 Lactose, cholesterol and gluten-free, Swedish Glace tasted no different from a regular ice cream and had a creamy texture. I really, really wish you could buy it here! 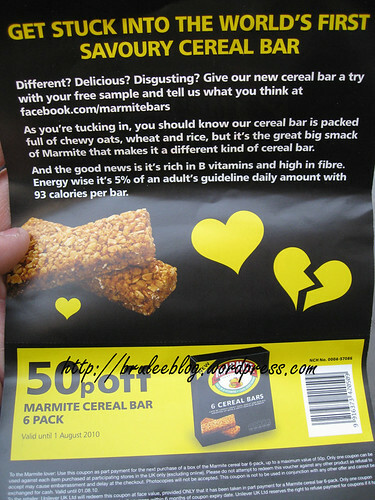 While I was in London they launched these new Marmite cereal bars. I managed to snag a sample (and coupon) as I passed by on my way to the Tube. Interesting marketing campaign, huh? Marmite, in case you don’t know what it is, is a yeast extract that is often spread on toast. If you’ve ever tried Marmite (or the Australian version Vegemite), then you will know exactly how this thing tastes like. NASTY. I took a bite of the bar and then spit it back out. One of our local hosts insisted that “real” Marmite on toast was much, much better, and I didn’t like that either. It’s definitely an acquired taste. I’m almost done the London posts! There are a few more to come, and then I’m moving on to Morocco. Vely intelesting… OK… who were your hosts? I didn’t know you stayed with someone. That would be interesting…. (hint) and why would you like that non dairy ice cream sold here? Because it is good is not reason enough. Go on…. 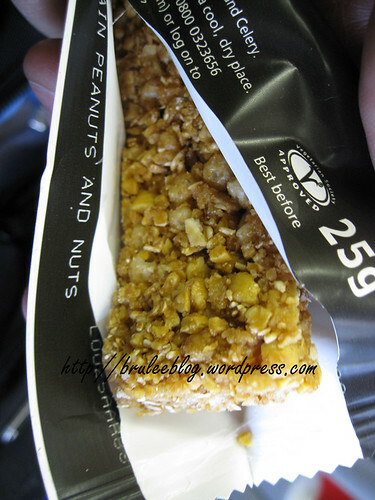 (I never had ONE snack while there…. unless you count Laduree’s Macaron’s from Harrod’s…. I usually like to try a local chocolate bar – but where we were, the little snack shops and grocery stores were open when we were up and out for the day, but closed too early in the evening for me to indulge! The sister of one of the people I travelled with was nice enough to let us crash at her flat for a few days. And non-dairy ice cream would be nice because I am (for the most part) lactose intolerant. That’s odd that the snack shops were closed early because there were always some open until quite late… maybe just the ones near your hotel were closed early? 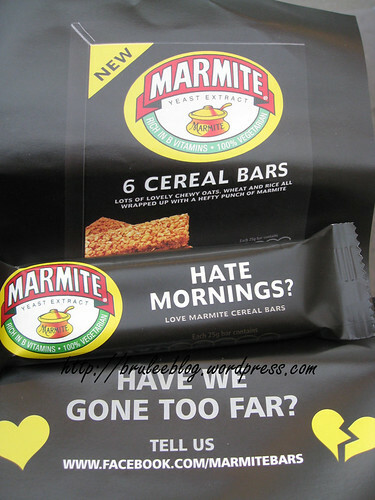 I love Marmite and those do not look at all appealing! 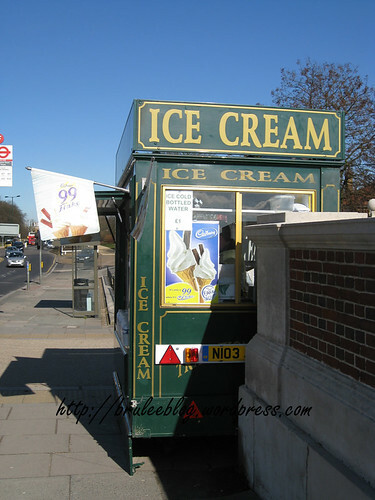 Sadly I was a bit disappointed in the 99 I had in Hyde Park; it didn’t taste anything like I remembered. My favourite snack used to be Scampi and Lemon corn snacks – kind of like Hawkin Cheezie texture but scampi and lemon flavour. I don’t think they make them anymore. Worchester sauce crisps are delish! I did try Walkers prawn last time, which I assume are close to the scampi flavour. I prefer Asian shrimp chips, I think.